During a recent road trip, my family and I decided to stop by the St. George temple visitors’ center, which is located not too far off the main I-15 freeway at the western Utah border near Arizona. Dedicated in 1877, the St. George temple is the oldest temple in the state of Utah, and I have heard that it has had more supposed sightings of dead spirits than any other temple. 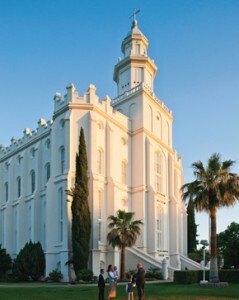 For example, it is documented in LDS writings that President Wilford Woodruff did work in this temple for the signers of the Declaration of Independence as well as John Wesley and Christopher Columbus. So we stopped by and walked inside. One elderly missionary insisted that we see a 15-minute video titled “God´s Plan for His Family” that promises the viewer “a greater understanding of God’s plan for each of us in this uplifting “Must See” Exhibit” (emphasis theirs). This exhibit was cleverly done, as visitors spend a few minutes in each of the five different exhibits that were cleverly designed to look like different parts of a home, with a video screen in the background in each station. The story of a baby being born, kids growing up, and the tender care of grandparents and their death as well as their resurrection is told. Kleenex boxes were conveniently located throughout to help those whose heart strings were being pulled. Probably the biggest emotional climax was when the grandfather—whose familiar signal to those he loved was an outstretched hand as if to say “hello”—died. Soon after, his wife joined him in the celestial glory and they’re holding hands once more. At this point, the sister (whose mission, she said, was ending the following week after 18 months) became very disoriented. She definitely had no answers. Because she must not have ever thought through these implications, she ended up excusing herself and then returned a few minutes later with one of the visitor center’s leaders. When the elderly gentleman came in, I explained my question. His response? Faithful Mormons will be in the Celestial Kingdom as mature adults. But, I said, that didn’t answer my question. Would he be there as a father? A son? A grandfather? The whole idea with its many possibilities (when you consider genealogical work) just boggles the mind. And, I asked, isn’t it true Mormonism teaches that God the Father was once like us and today is the father of all creation? Isn’t that His main job, as a “father,” and not as a “son” or “grandfather”? Do we have any evidence that God the Father’s grandfather lives in the same realm as Elohim? I’ve never heard this issue addressed in General Conference. When the phrase “Families are Forever” is used, just what does that mean? According to the elder, it means that the family is “linked” together. They are not necessarily living in the same “house” but have the chance to be “together” through their connections. Again, I pointed out how different this was from what the video was portraying. As far as the possibility that certain members of the family were not faithful, he explained the Mormon idea that they would be required to exist in a lower realm (the terrestrial). Faithful Mormons in the celestial could go down to visit them, but these folks could never go up to visit the faithful Mormons. In other words, everyone in the family must be faithful for this “forever family” scenario to work. I guess we can forget about all the black sheep of our families. Or those family members who just don’t have what it takes. The presentation at the St. George temple was very slick and emotion-driven. It would be easy for someone who was naively considering the LDS Church to join based on this manipulative piece alone. The way it was portrayed, strictly from a human level, seemed wonderful. Yet the video never mentioned anything about God, Jesus, or salvation by grace through faith. Doctrines were left alone. This presentation was all about being together with loved ones, whom we know end up leaving us at inopportune times through heart attacks and strokes. How desperately we want to see them again! How much we would give to be with them again! But with no basis in biblical truth or any type of logic, such a presentation is nothing more than a pie-in-the-sky promise, as empty as the words it took to deliver the message. How many fall for this promising message but with no basis in hope? Well, in the three minutes it took you to read this article, three more converts have been baptized into the church. Obviously the Mormons are good at growing their church using these methods and I’m afraid it’s just not going to go away anytime soon. This entry was posted in Family and tagged Families are Forever. Bookmark the permalink. The LDS doctrines of eternal marriage directly contradict the words of our savior. Not sure how they reconcile that one. Your usage of the word "clever" to describe the presentation on families suggests some degree of dishonesty. Could it be that we actually believe those things that were presented in the video? I don't understand why you conclude that the presentation was "clever" or dishonest, as if the church were hiding something. Again, the conspiracy theorist in you comes out. Are we using people's feelings for their families to trick them into joining our church? Why can you not simply disagree with our doctrine instead of concluding we are dishonest or misleading? We happen to believe that normal people's most sensitive and powerful feelings outside of their love for God are directed toward their family members for a reason. Why would God place so much emphasis on family and marriage throughout the Bible if it were merely a brief relationship limited to this life. Other than the role of a man and woman in creating a baby, the emphasis on family makes no sense unless there is a deeper, more significant role to be played by the family in the designs of God. EV critics love to talk about we all believe we will have our own worlds, etc. etc. I honestly have no idea if that would ever be in my future- I really don't think much in those terms. I think the community of those who inhabit the celestial kingdom will be closer than you or I think. The issue of proximity that you bring up seems like it originates from such a mortal, limited mindset. It is like saying there is no way we could all be loved by God- there are simply too many of us for one being to love. If Jesus and the Father could have such close communion while Christ was upon the earth- enough so that they were "one," I doubt loved ones could not also be "one" after this life, no matter where they were in proximity to each other. This article was posted by Eric Johnson, not Sharon. "Why would God place so much emphasis on family and marriage throughout the Bible if it were merely a brief relationship limited to this life. Other than the role of a man and woman in creating a baby, the emphasis on family makes no sense unless there is a deeper, more significant role to be played by the family in the designs of God." Families are definitely important. The problem is, from here on your beliefs are tied to Joseph´s teachings, and are not based on anything written in the bible. The reason Eric said it is clever, is, in my opinion, that people´s love for their families is being used to ultimately lead them to believe in false prophets, a false god, and the blasphemous notion that one day they´ll become gods, living in polygamy reproducing throughout eternity, populating billions of planets, etc. You might not think much about it now, but you know that´s exactly what you´re expecting for the next life, and that´s the reward you cling to when things get tough. I don´t believe anybody here doubts the mormon people´s sincerity and love towards their families, but if it isn´t based on the Word of God you can pretty much create any doctrine you want and fit it in with the Bible somehow. By bad- I mistakenly thought Sharon wrote this article. Is it an insignificant thing to suggest an organization or person is being dishonest or false? It is a huge deal to somebody who takes honesty seriously. Again- disagreeing with our doctrine is one thing. Claiming we are false or dishonest is another thing entirely. Why must EVs make that jump in their criticism of the church and its members? It is the need to assign a more sinister and devilish character and nature to the church in order to justify yourselves and the amount of time and energy you expend criticizing it. you prove to be a worthy Mormon male ? The LDS church teaches that the fall in the garden is what allows man the ability to choose right from wrong by knowing good from evil, which allows you to choose "Jehovah's plan". In reality Satan is your savior, not Jesus Christ, for he is the instigator of the fall. Christ "atonement" is merely a tool that allows you to access the power of the gospel and grace. This knowledge of good and evil, choosing to do right in following the LDS gospel, and your temple covenants and marriages are what proves your worthiness to become exalted, meriting the celestial kingdom. But that is just downright blasphemous so your church hides its lies among the candy and lollipop tales of forever families, which has become the new billboard for Mormonism, "You will surely not be separated from your family at death, no matter where you are, because Heavenly Father loves all of his children. The false churches of Christianity teach that all of your sins can be forgiven by faith in Jesus Christ, and apart from Christ's vicarious atonement for your sins a holy and just God must send you to an eternal hell for your violations of His law. But that is not true. All people will be saved in the resurrection of their bodies, but you and your whole family can be super saved by believing the restored gospel of Jesus Christ found only in the one true church, which is based upon this magically restored book, The Book of Mormon." That's the lie of your church, Jim, and you are well aware of it. I cannot think of a more sinister and devilish promise that is leading men's souls to hell. Faith in a non-god and non-messiah is no faith at all. I can use this same argument against you. So i suggest you remove those verses in Joseph Smith-History about how God told JS how all creeds were an abomination, all teachers corrupts, etc. I also suggest that you send all your missionaries home, they need to stop wasting that amount of time and energy telling people everything they believe is wrong, etc. I didn´t criticize the members, i criticized the way the church uses a "weakness" which is family love to convince them to worship a false god in a false system. See, either your god is true and mine is false, or mine is true and yours is false and your doctrine stands on Joseph Smith´s authority alone. Also, have you heard of false advertising? you should tell people to stop "the amount of time and energy you expend criticizing it". It´s ok to be deceived into buying a great product that doesn´t deliver what was promised, right? It´s also ok to let others be deceived by someone´s omission as well? I don´t think so. The only way you could work things out the way you propose is to be universalist, which the mormon church is in a way, when it says all will be saved(meaning saved from the first death, physical death, not from the second death though). "for, as to other legislators, they followed fables, and, by their discourses, transferred the most reproachful of human vices unto the gods, and so afforded wicked men the most plausible excuses for their crimes;"
That shines new light in why the mormon god is a polygamous god that´s ever increasing in glory, doesn´t it? You are brilliant. The devil is my God. How did you figure that out? f_melo- your statement from Josephus proves nothing about the Church of Jesus Christ of Latter-day Saints. According to you, every religion but yours is guilty of false advertising. You are incredible. Like I said previously, the most effective approach for LDS on this site is to let the critics expose themselve as the quacks that they are. I believe that relationships of all nature are incredibly significant, not because they are going to carry on but because they are an imperfect, mortal, tangible example of the ultimate relationship we were created to have. Living and loving a spouse is a way for me to try to grasp unconditional love, selflessness, vulnerability…to try and see in terms I can understand how God love's me and how I'm to trust in him. Mormonism seems very selfish to me. Everything is revolving around each member, that's the product sold at least. And that's why propaganda like the video discussed are illogical, my husband can't be the center of his own world and then be able to interact in a familial way with the family he had on earth, because then they'd have to revolve around him but they would leave them no gravitational pull to start spinning worlds of their own. Biblical Christianity is about dying to self and revolving around God. Failing to be Christlike and learning in those failures about the miracle of being bought and loved by a God that didn't owe you anything. Yes, those statements prove that over two thousand years ago people would reflect their vices into their gods and would thus find excuses to do whatever they wanted. That´s exactly why the mormon god is polygamous, because Joseph wanted to live a polygamous life, so he had to make a polygamous god to justify it. That simple! It´s my religion that´s right and everyone else is wrong – there you go with your Joseph´s mentality again. It´s not me against you, it´s the Word of God against false religions. and yes, any religion that doesn´t preach the true Jesus is doing false advertising… why do you think so much of the new testament is Jesus and the Apostles warning the church about false prophets and false doctrines? Have you actually read it? I have gone through the presentation of the "forever family" numerous times at the visitors center. While I slightly begrudge the appropriation of adoption language -the larger issue is that of family. They show two loving nuclear family's and it is very loving and sugary sweet. All fine and dandy – and in a culture where this is the exception not the rule any more – very attractive. Of course this is what is makes it good salesmanship, but I would argue what makes it most subversive and false. Joseph is brought up as the prophet near the end of the presentation and the restored gospel is mentioned but not explained in any way. Then when the presentation is over the ladies virtually always say words to the effect "Wouldn't you like a forever family as well?" I always affirm God's creation of, interest in and divine plan for the family. And it is that very interest and plan that keeps me from even possibly seeing Joseph Smith as a true prophet of God. Of course at this point they are shocked – why would I say such a terrible thing? After all these missionaries have been raised to see Joseph as a great son, a great husband, a great father and so on. The model man in so many ways…But I digress. I then bring up Todd Compton's book "In Sacred Loneliness" (written by a faithful Mormon, published by a faithful Mormon publisher) and point out to the missionaries how 9 out of 12 of Joseph's were married to other men when Joseph married them. How does Joseph in any fashion, form or way become a model for marriage? Then I try and get to the biblical Gospel and so on. Usually there is strong reactions – I must be lying, I hate mormons, yada yada yada, but the facts are there. If you want you could go to Brigham and of course the problem gets even worse. When Bill M and a few of us went to the BeeHive last year – the missionariettes were trying to sell Brigham as the model husband and father as well. Bill correctly asked something to the effect how this could be the case when many of his wives and children didn't even live in the Beehive but somewhere else??? And perhaps one should reconsider his teaching on the nature of the Bible, God, salvation and so many other things as well. What must I do to post a comment that is longer than 200-300 words? Jim, Could you share what you expect exaltation in the Celestial Kingdom will entail for you ? Weren't women sealed to JS postmortem that weren't married to him in this life? Yes, and to Brigham Young as well. I guess this is one of those mysteries we´ll only understand after this life. Sometimes i have that problem, the blog´s posting system doesn´t load… try changing your browser, sometimes it helps. I wonder how long until it will be said that we believe in vampires and werewolves and teach about them every Sunday. Just for the record, we do not accept the "Twilight" series as official church doctrine, no matter how many girls fall in love with that series. I saw the light the other day and low and behold, it is still the same church I attend. Evangelicals are a perfect example of when Chirst talked about trying to repair the old garment or trying to put new wine into old bottles. You replace prophecy with philosophy. You cling to a religion that in so many ways has been torn apart so much and put back together that you don't even know what the original pattern was. You cling to an idea that simply having a bible gives youl sole claim to authority over all doctrine of Christ's church. Your church is merely a characature of what once was perfect and plain. It has been corrupted by the inclusion of pagan thoughts and ideas as well as those who saw fit to manipulate scripture for their own means. You have this chip on your shoulder that we claim to be the true church yet you have the same opinion about you own church, I'm sorry "churches" as you don't subscribe to being part of a single united entity. I am sure that is what Christ had in mind when he commanded his disciples to be "one". I would like to ask the question about a recent even. The recent incedent of the bishop being shot in Visalia, California. Where will he find himself as he was probably a member in full standing to the church? I would sure love a straightforward answer. Reading your post, and Eric's original post, I am (sadly) not at all surprised. One of the most striking features of popular Mormonism is its utter non-interest in important content. I'll never come to terms with it. For example, as you pointed out to the missionariettes, the LDS promotes Joseph Smith as the best thing since sliced bread, and yet prefers to hide him under a bucket (contra Matt 5:15). Same with the "Forever families" thing – if you're going to push the idea of eternal families that look exactly like earthy families, you could at least provied a picture of what an eternal family is (daughter/mother/wife/wives/goddesses). Same with anything remotely doctrinal. Now, I'm not expecting people to have the answer to all of life's important questions, but one thing that worries me about this more than anything is it's caustic effect on his or her perception of transcendant Truth. I mean, if Joseph Smith, forever families, doctrines are nothing more than nebulous fluids that assume the shape of whatever I pour them into, what am I to think of Jesus Christ, God, life, death the universe and everything else? In this context, perhaps the most confronting issue is the Word of God become flesh (John 1:14). I find myself meditating on this quite a lot, but one of its implications is that God has appeared to us in a way that we can see, hear, smell and touch. Having seen, heard, smelled and touched Him, we do not necessarily have a comprehension of who he is (John 1:10-11). However, what it does tell us is that God can be known, He is recognizable as a person, and that by being one person, He is not another. In other words, He cannot be reshaped by my aspirations and prejudices. He transcends my aspirations and prejudices (that's what I mean by "transcendant Truth"). Mormonism seems to give its followers free licence to reshape anything they like according to whatever they feel like at the time. That's about as far from a transcendant God as I can think. system started, I guess you missed that. lol, you're right, i did miss it. I could hear your voice coming through, but couldn't put a finger on it. Thanks for replying. The forever families proposition just does not add up. Relationships among people are changing. To present a nuclear family in their program, Mormons are being dishonest – the father/mother/son/daughter relationships change to grandfather/grandmother/son/daughter/grandson/granddaughter change to great grandfather/ great… etc. etc. If everyone is sealed to everyone else through multiple generations it just does not make sense. If it was true, the Mormon family in the afterlife would be a group of adults, multiple generations, sealed to one another through the temple – basically an assembly of adults relating to each other obviously in ways they did not here on earth as age distinctions will be gone, and all will be serving as both parents, grandparents, children, aunts, uncles, etc. In truth, our vocations (roles in serving others) in life change as we grow older, and so also will our position change in eternity, where we will not be married according to Jesus. Mormons contradict Jesus on marriage and end up with a muddled mess. Asking the sister missionary tour guide these questions about relationships presents a cognitive dissonance, a realization that the pyramid scheme just doesn't add up – relationships can't be locked in a vacuum and sealed for eternity. In the same way, Sadducees tried to trap Jesus with the question about the woman who had been married 7 times, whose wife would she be? Jesus clearly answered that there is no marriage in eternity (Luke 20:34-35) – while the Mormon missionary had no answers, Jesus did and does. What are you asking exactly? You want to know where the bishop will find himself? As in… what? The afterlife? "Mad" hardly. I like to visit this place for a good chuckle. Honestly buddy, I bear no grudge for a single blog that I visit only on my spare time. What gets me mad is when I am walking on a crosswalk with a green light and someone almost runs me over. But that is beside the point. I make no exaggeration about the old cloth with the patches or the new wine in a wine bottle. Just as the Jews of Christ time lost the truths and original doctrines so they made up their own ideas of what their faith was. How had this happened? Well, number one they killed the prophets. Now if they had the scriptures to begin with, then what was the necessity to have more prophets? Could it possibly be that along with scripture a prophet is also needed to further the guidance of the Lord. Yet you do the same thing as well. you are the descendants of those who killed the prophets and you claim no need for such. You then ascribe centuries of philosophy to fill the void of direct revelation and prophecy from God. You then take scriptures that were written for the body of Christ church and misconstrue it to your own damnation. I know I said the "D" word but I mean it in a biblical sense not a swearing sense. Here you are trying to find a validity for not needing to get married. That an institution provided by God is somehow not necessary. You use such blasphemous gross misrepresentations. Heck, why not become a nun or a priest and say that you are married to the Lord and swear off any need to get married. I even have one christian friend of mine using another quote by an apostle as to say that not everyone should get married. Then why do we even have families. Let us all just simply believe in the Lord and procreate at will to just simple have more children who can believe in the Lord. "Yet you do the same thing as well. you are the descendants of those who killed the prophets and you claim no need for such. You then ascribe centuries of philosophy to fill the void of direct revelation and prophecy from God." My goodness – unbelievable. We are the descendants of those who killed the prophets? You are joking, right? Can you read scripture in context? I didn´t think so. Centuries of philosophy? Have you read the Apostles creed, or 1 corinthians 15? That´s the earliest creed given by the Apostle Paul himself. You´re spitting on Paul´s face, insulting true Christians. You´re the one who is descendant of those who killed the prophets because you trample their words under your feet, and spit on them, and replace them with the words of a false prophet, who claims that God was once a man, and you too can become a god, one among millions of gods!!!!!!!!! Matthew 11:13 – "For all the prophets and the law prophesied until John". How can it be clearer? If you deny that you´re denying the very words of Jesus Christ! "Here you are trying to find a validity for not needing to get married." (…) "Then why do we even have families. Let us all just simply believe in the Lord and procreate at will to just simple have more children who can believe in the Lord." Who said that here Mr. Straw Man? Please, be specific.
" I even have one christian friend of mine using another quote by an apostle as to say that not everyone should get married." What Apostle said that? If it is truly said in the Bible, will you reject it? Of course, the Bible doesn´t mean anything to you as you have plainly shown. Is that the entire base for your argumentation? "Your church is merely a characature of what once was perfect and plain. It has been corrupted by the inclusion of pagan thoughts and ideas as well as those who saw fit to manipulate scripture for their own means." Can you provide any evidence for that, please? "You have this chip on your shoulder that we claim to be the true church yet you have the same opinion about you own church, I'm sorry "churches" as you don't subscribe to being part of a single united entity. I am sure that is what Christ had in mind when he commanded his disciples to be "one". " Nobody here claims to own the truth. We follow the Bible and the Bible says "For where two or three are gathered together in my name, there am I in the midst of them. "(Matthew 18:20) – The church is not a group of buildings, and it is not contained in a name. The church is composed of believers – whatever they call themselves, as long as they believe in the Jesus as taught in the Bible, follow Christ´s teachings found in the Bible and have been born again, they are the church. You pervert the church of Christ, and lie saying that you´re the restoration of the original church – I´ve read the new testament a few times, i don´t remember the original church having stakes, or having 12-year old deacons, or any false priesthood – let alone many temples with masonic ceremonies and funny robes, eternal marriages, etc…. care to explain? The united entity is called Christianity which mormonism is not part of. "Evangelicals are a perfect example of when Chirst talked about trying to repair the old garment or trying to put new wine into old bottles." "You replace prophecy with philosophy." That made me LOL. Lets talk about Kolob, then – what do you think? What about the fact that matter is eternal and cannot be created, or, as in physics, the law of enthropy? God for you is only an architect right? Your doctrine is the one that sounds like philosophy – greek mythology actually. You´ve got to read some books non-authorized by your church once in a while, you know, to learn how reality is like. to castigate everyone who you like to call an " evangelical " is telling. This verse does not say marriage will not exist in heaven. That is an assumption you make. It says no marriage ceremonies will occur there That is in harmony with LDS theology, they must be performed here alive or by proxy. Try again.